One of two immigration bills being voted on by the House today. Pete Suratos reports. The House on Thursday passed two pieces of legislation — one of which was spurred by a Bay Area woman's shooting death — that will stiffen punishments on people who re-enter the U.S. illegally and for "sanctuary" jurisdictions that refuse to cooperate with federal deportation forces. "Kate's Law" will impose harsher mandatory minimum prison sentences on deportees who re-enter the United States, with stronger penalty increases for those who have been convicted of non-immigration crimes. The bill was named after 32-year old Kathryn Steinle, who was gunned down while she strolled along San Francisco's Pier 14 with her father. The Pleasanton woman's alleged killer, Juan Francisco Lopez-Sanchez, is an undocumented immigrant who was released by the San Francisco Sheriff's Department just months before the July 1, 2015 incident, despite requests by Immigrations and Customs Enforcement officials to keep him behind bars. Lopez-Sanchez, of Texas, has pleaded not guilty to the crime, but the fatal shooting put San Francisco's sanctuary city policy in the national spotlight. 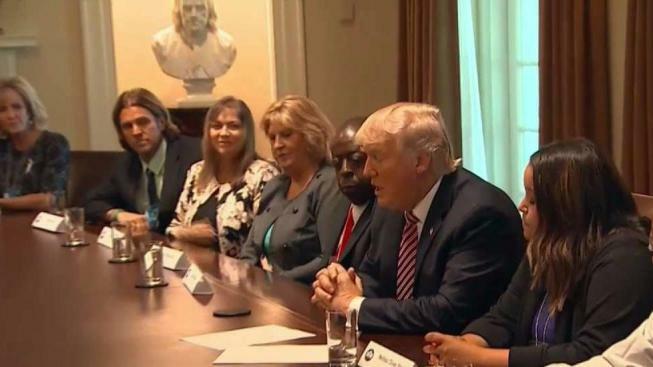 During a roundtable at the White House on Wednesday with family members of those killed by undocumented immigrants, Trump talked about the importance of "Kate’s Law." "This law will enhance criminal penalties for those who repeatedly reenter the country illegally," the president said. A second approved bill, "No Sanctuary for Criminals Act," will bar states and localities that refuse to cooperate with immigration authorities from receiving certain Department of Justice and Department of Homeland Security grants, including some related to law enforcement and terrorism. Trump argued the bills will close "dangerous loopholes exploited by criminals, gang members, drug dealers, killers, terrorists," and told the family members gathered that they'd "lost the people that you love because our government refused to enforce our nation's immigration laws." But Lorella Praeli, the director of immigration policy at the American Civil Liberties Union, criticized the bills, saying they were "riddled with constitutional violations that completely disregard the civil and human rights of immigrants." "Despite claims to the contrary," she said in a statement, "Kate's Law and the No Sanctuary for Criminals Act will make our communities less safe by undermining the trust that law enforcement builds with its communities — citizen and immigrant alike."